We see so many different types of people in clinic having their tattoos removed. From middle class mothers, to the student with a tattoo from freshers week that they need to get rid of before their parents notice, the main thing they have in common is ink they regret. We have found that the reasons given by clients for having their tattoos removed are as as individual as the clients themselves, however there is one reason that we are hearing more and more. It has been estimated that 1 million people have been inked whilst under the influence of alcohol and we are seeing an increasing number of clients who fall into this category. 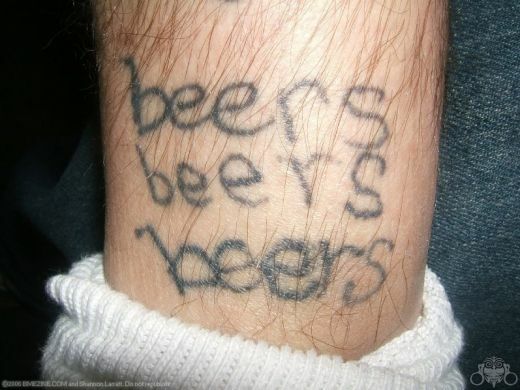 They may have had one too many on a lads holiday or a boozy night out, and decided to commemorate their fleeting sense of friendship and freedom with some permanent body art. A very attractive idea in theory, less so in practice! The problem is that your ‘lads on tour’ tattoo might quickly seem less like a symbol of free spirit and more like a symbol of poor judgement. It might be badly done, inappropriately placed, or just an ugly eyesore that is bitterly regretted the minute the hangover has cleared. Family members might be disparaging and employers might be furious – especially if the tattoo is in a visible location and you have a customer facing job. In the past, people who have found themselves in this situation would have to learn a lifelong lesson. They would be left with a permanent reminder of their folly that they would learn to hide, camouflage or live with. Luckily, we now have a very effective solution available for safe, effective and affordable tattoo removal. Using our active q-switched Nd: YAG laser, we offer advanced hospital grade tattoo removal in comfortable clinical surroundings. Most tattoos can be removed in around 6-10 sessions, spaced 6 weeks apart, meaning that this year’s mistake needn’t be next year’s misfortune.